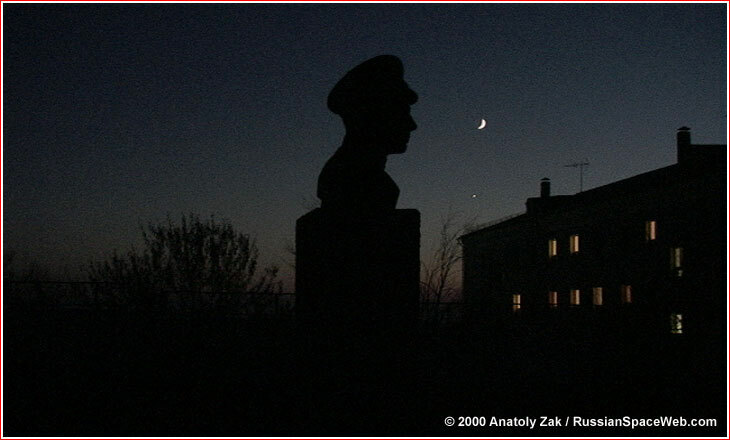 A monument depicting young Yuri Gagarin faces the new moon at Site 2 in Baikonur Cosmodrome, just meters from the site, where the first space traveler of the planet Earth spent his last night before a historic mission. During my army service in the 1980s, at a remote site in northern Russia, I was sometimes asked to draw a propaganda poster, a leaflet or a sign for our barracks. Even though, my army-commissioned art was mostly limited to crude copying of the portraits of Vladimir Lenin or primitive exercises in typography, I found my "artistic experiments" as a great relief from exhaustion of daily service. 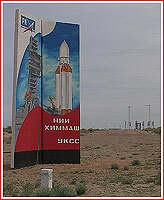 I remembered this experience years later on one trip to Baikonur, when I saw a soldier painting a picture of a rocket on a large block of concrete, which marked the entrance into the launch facility. 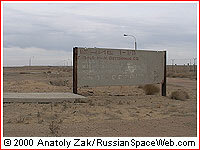 When driving around Baikonur, I saw numerous walls, road signs or simply pieces of concrete touched by a brush of unknown artists. Some artwork still reminded about old ideology, intentionally or unintentionally preserved as in a time capsule, some were brand-new, poeticizing the exploration of space rather then "the party line." No doubt, the majority of this uncelebrated paintings and sculptures were created by conscript soldiers, who spend most of their two-year service in Baikonur repairing roads, laying bricks, driving trucks, guarding gates, cleaning, cooking and so on. I tried to preserve on film as many examples of the "soldiers' art" as possible. The result was this page dedicated to those countless painters and sculptors, to their time, life, talent and often unwilling sacrifice to the exploration of space. 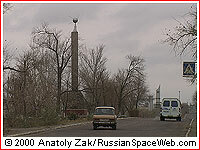 Two monuments in the Soldier's Park mark graves of those, who died during the Nedelin disaster in October 1960 and in an accident with the R-9 missile exactly three years later. 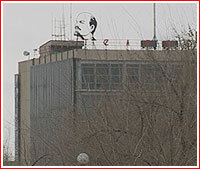 A "must" for every Soviet city -- a statue of Vladimir Lenin -- by the architect N. Asatur and sculptor Posyadko was opened in 1970 at the central square of Baikonur. 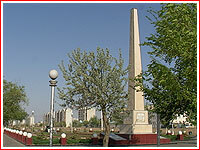 A monument dedicated to Sergei Korolev by sculptor Faidush-Karandievskiy was opened in November 1970. 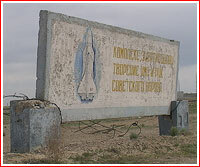 The monument "Science and Space" was opened in April 1974, on the eve of the Soyuz-Apollo docking mission. 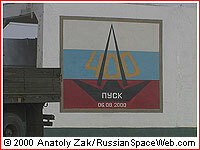 In June 1980, a full-scale mockup of the Soyuz launcher was erected at Marx Street. 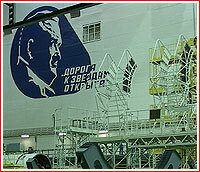 A monument to Shubnikov, the original chief of construction at Baikonur, was unveiled on March 8, 1983, in commemoration of his 80th birthday. 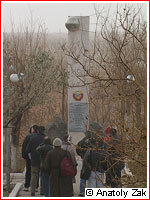 A monument to Mikhail Yangel by G. Kalchenko was opened in 1980. 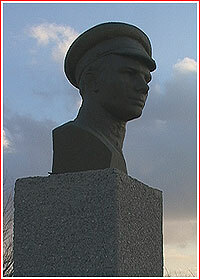 A monument to Yuri Gagarin designed by private O. Pesotskiy, was unveiled in November 1983. 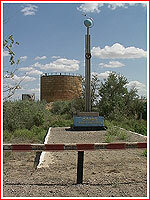 Another monument to the first satellite in residential area of Site 17 in Baikonur. Click to enlarge: 400 by 300 pixels / 39K Copyright © 2000 Anatoly Zak.